Plot: Two boys face an onslaught from witches, monsters, ghouls and a talking dummy after they discover a mysterious book by author R.L. Stine. Starring: Madison Iseman, Wendi McLendon-Covey, Jeremy Ray Taylor, Chris Parnell. 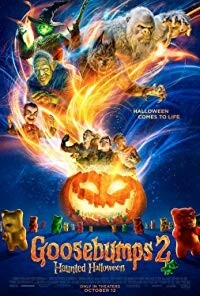 distributed by Sony / Columbia «Goosebumps 2: Haunted Halloween» in the US movie theaters released on October 12, 2018 and has grossed over $90 million worldwide; dvd and blu-ray release date was set for January 15, 2019. Rent from Netflix and Redbox from January 15, 2019. «Goosebumps 2: Haunted Halloween» in the UK released in movie theaters on October 12, 2018. The movie estimated to release on dvd and blu-ray some time in January or February 2019.